William Carver Hooton was a pioneeer settler of Hootontown, Missouri. Hooton researchers please email Valerie Hooton. None of these Stone Countians have been identified. 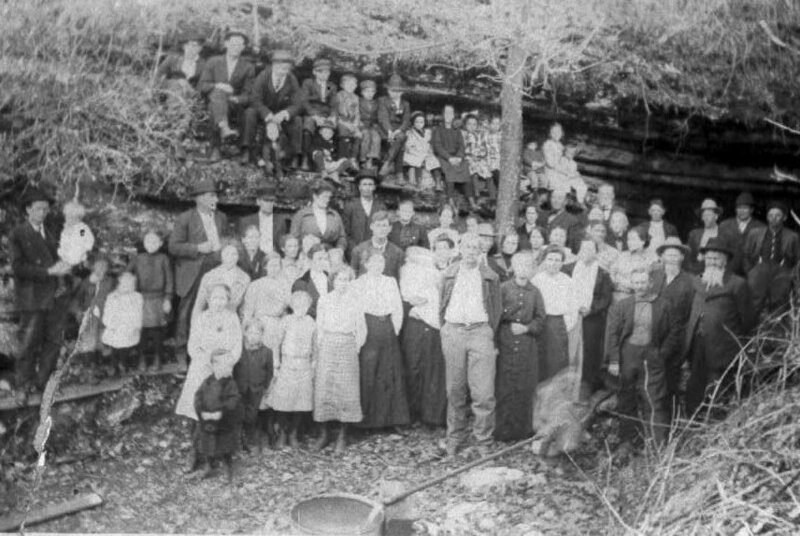 They are gathered at what looks to be the mouth of a cave which seems to be the source of a spring. Bill Hooton thinks that at least some of the people must be Hooton family members. If you recognize any of the people, or if you know where the cave is located, please contact Valerie Hooton. This charming photo from the collection of Bill Hooton offers us a glimpse of a what must have been a refreshing treat for a pioneer family. 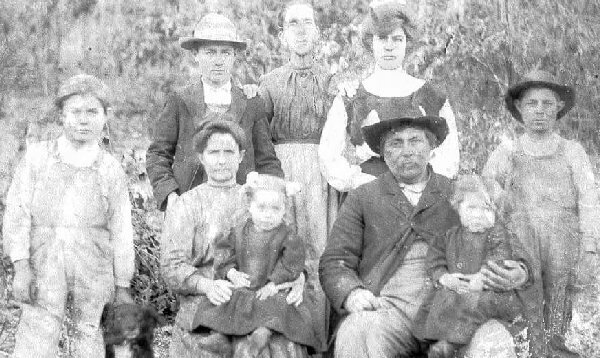 Pictured from left: Rebecca Hooton; William Carver Hooton; the two little boys’ names are unknown; little girl-Louise Cochran (granddaughter of Rebecca & Benjamin); Benjamin Hooton (husband of Rebecca, & son of Wiliam);and an unknown friend of the family stands on the far right. Benjamin Hooton was 13 years old when his father, William was a soldier in the Civil War. Benjamin told a family member that they were forced to hide in a cave to avoid Bushwhackers, and that his three year old sister died in his arms while they were hiding. Bill Hooton is the grandson of Benjamin and Rebecca. 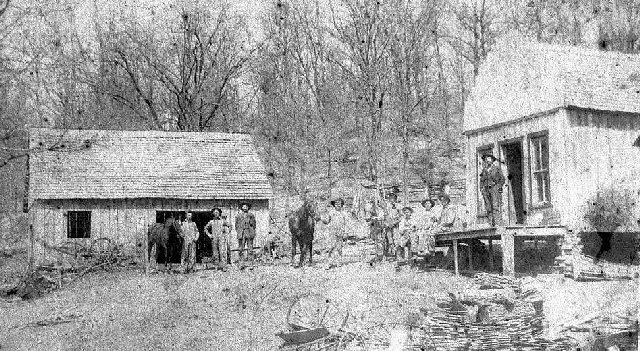 *Note by Jo Dunne: This photo was sent to me by Bill Hooton, great-grandson of William Carver Hooton, one of the first settlers of Hootontown. Bill believes the town was first called Hootonville. Though it is sometimes spelled Hooten, the original spelling was Hooton. My great-grandaunt Emmie Jackson was married to Jim Hooton, son of Benjamin Hooton. William Carver Hooton and Benjamin were cousins. 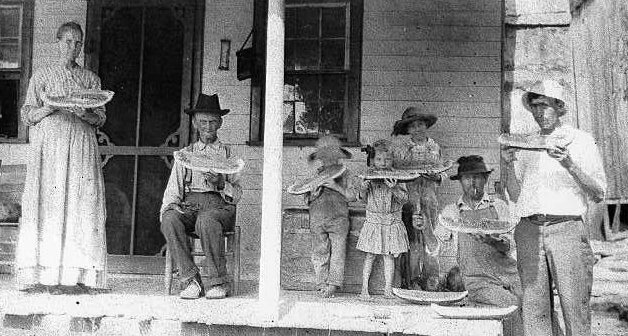 This wonderful collection of photos belongs to Bill Hooton, great-grandson of William Carver Hooton, founder of Hootontown, Missouri. 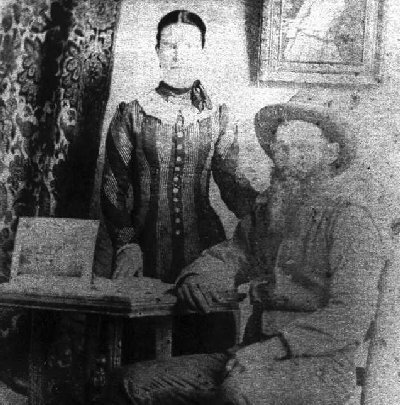 William Carver and his cousin, Benjamin Hooton were pioneer settlers of Stone County. We are very grateful to Bill Hooton for sharing these treasured photographs with us. Hooton researchers may email Valerie Hooton (linked above). Thanks Al, it is interesting stuff. I’ll keep digging up stuff about the James River area. I might even drop a barber shop story in. That was pretty nice…my husband and I have lived in Hootentown, for almost 10 years and have never seen any history. Thank you so much for sharing. This is awesome. My grandmother’s name was Thelma Hooten, daughter of Felix and Ida. I’ve recently started researching my family history, so to stumble onto this website is such a blessing. I’d love to take a trip to Hootontown with my dad someday and see where her family came from. Its really kind of crazy how my mothers family looks like some of these people. I was always told my GPA Paul Hooton was from hootontown missouri. I am also related to Felix. Felix & Ida are my Great Grandpa & Grandma. My Grandpa was LLoyd Hooton their son and your grandma’s brother. I remember Thelma when I has a little boy. I hope you reply back soon. Would like to here more about our family tree. If you need any help with the Hooton history I can help you with that. You can find me on Facebook as Aj Marcum I am the great granddaughter of Felix Hooton and Ida Melton. I do believe the cave in the picture is what is now called Hootentown cave….several friends of mine have been mapping this cave. I could be wrong but the entrance looks the same to me. Are you taking any photos? I have many pictures of this cave, its on the edge of my grandparents property. I really love the picture’s . My Great great grand parents are William Carver Hooton and Matilda Jackson. And Benjamin Hooton and Rebecca Carver are my great great great grand parents. I never had those pictures before. Now I do. Thank you so much for this page. I stumbled upon an old cemetery with several headstones belonging to the Hooton family. Very interesting. I grew up in Hootentown and know Bill Hooten. My name is angie marcum (williams) I am the great granddaughter of Felix and Ida hooton. My grandparents was Paul hooton sr. And Margaret Clark. My mother is Ida Williams (hooton). Some of you may know me, some I may want to know.